The very first shredder was invented in 1909, by Abbot Augustos Low and modified by Adolf Ehinger. It was used to destroy anti-Nazi propaganda to ensure it wasn’t discovered by any secret police. 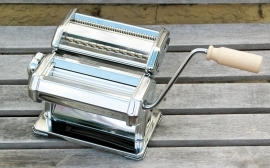 The invention was related to a hand-cranked pasta cutter. By the 1980’s, the popularity of shredding grew, and it became a household item. Families became adapted to shredding to protect their own confidential information. Most commonly they were used in the industrial, commercial and government divisions. Since the start, the shredder was designed to cut paper into long thing strips and was replaced with more complex cutting since the pieces were still able to be formed together and information was identifiable. New techniques involve grinders which use more blades for smaller cuts, to pass the mesh inside. There was also a cross cutter design. The purpose was to reduces pages into circular or square pieces only millimetres long and wide. Shredding has contributed to the protection and safety of your loved ones, legal issues and your business is thanked to shredding. It improves data security, reputation, financial consequences and is beneficial for accountants and public service providers. It is encouraged for sustainability and a positive environmental impact, for simpler recycling. Give Shred-All a try.